Fall in here and with it comes a change in color palette and in ambiance. The world is painted in shades of orange, red and yellow and, as it gets chilly outside, we start to feel super cozy in our homes. This warmth and this charm are reflected in the way we decorate our homes during this season. We’re talking not only about all the gorgeous fall centerpieces which we display on out tables but also about the outdoor fall decor which can take many different forms. Check out a few of the possibilities below. 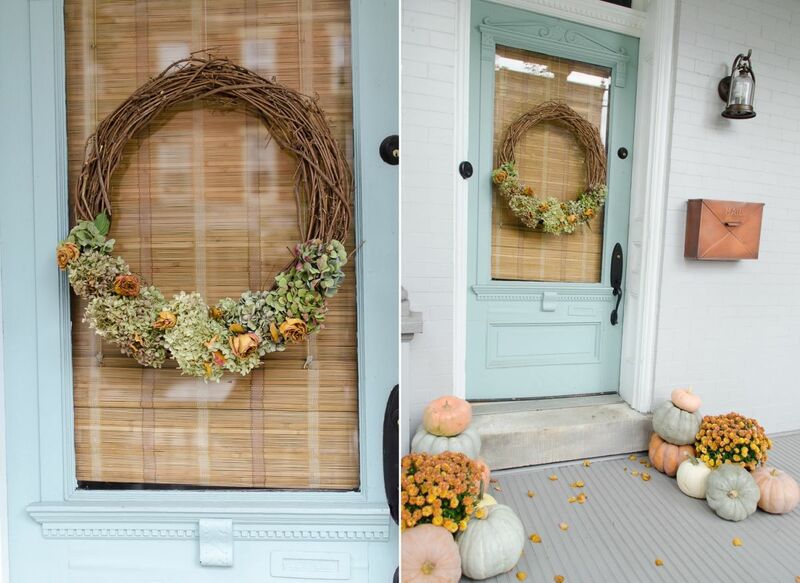 Welcome autumn with a few charming outdoor decor elements such as a lovely wreath and some pumpkins. You can decorate the wreath with dried florwers and leaves and you can hang it on your front door, as shown on homestoriesatoz. 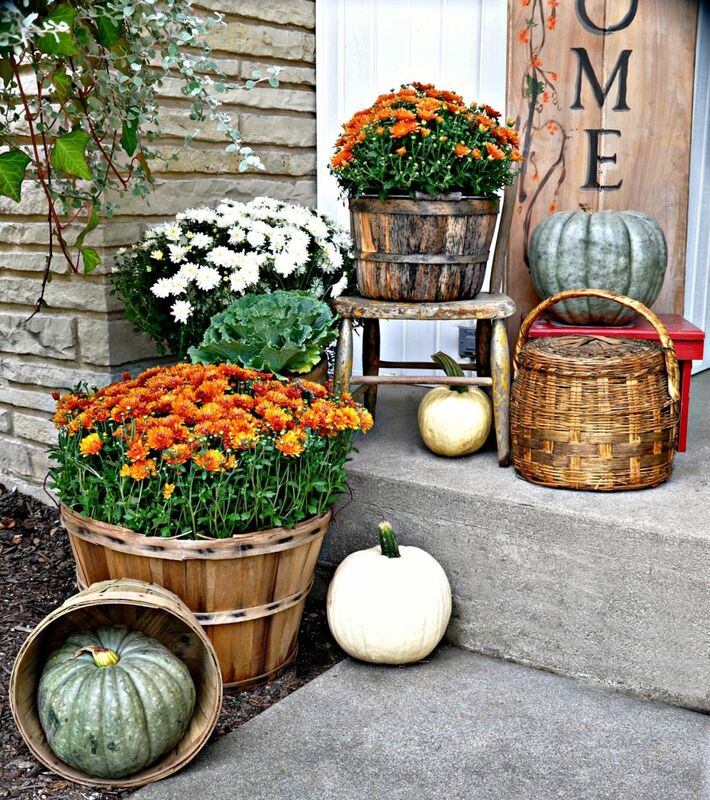 A fall porch decor can be simple and at the same time very suggestive, like shown on yellowprairieinteriors. 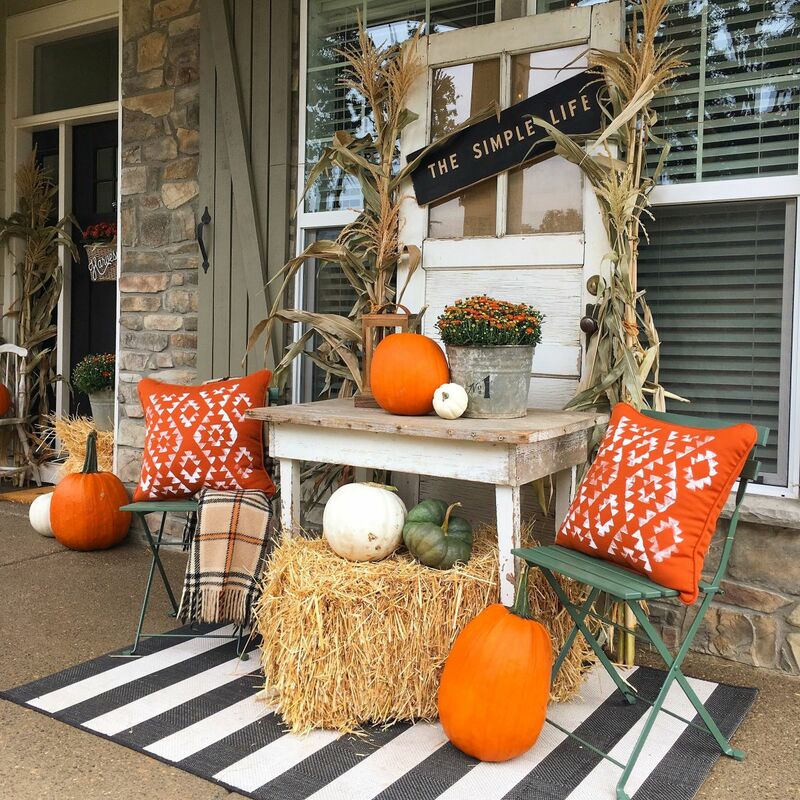 You can add a hay bale as a stool or side table, some accent pillows on the chairs featuring fall-inspired colors and you can also find inspiration in some of the pumpkin decor ideas we shared with you a while back. Also, look for things you can repurpose, like old furniture, a rug or even an old door. 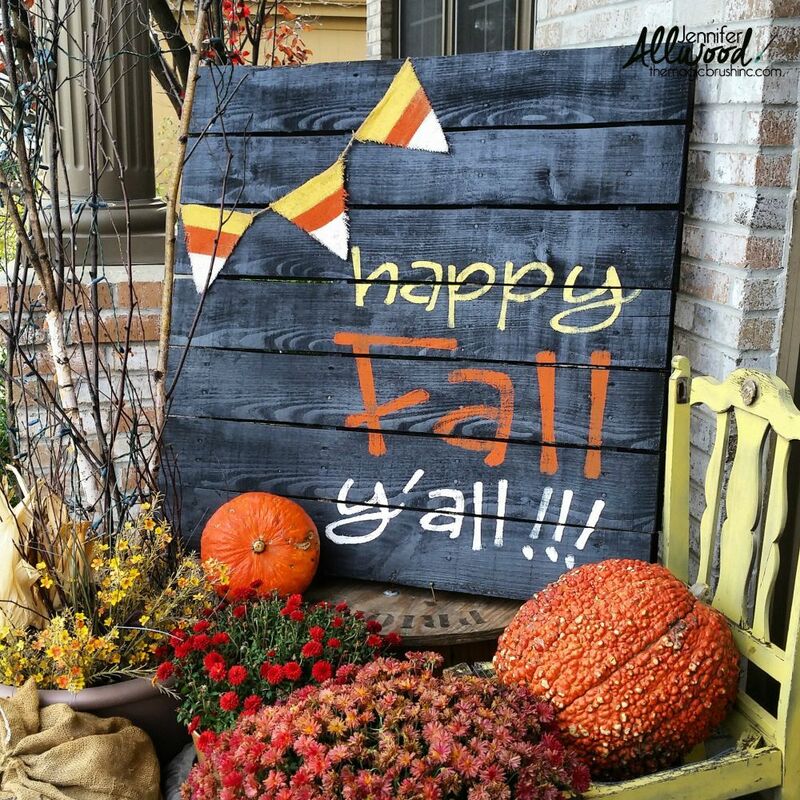 You can capture the charm and bountiful beauty of fall in a lot of different ways and since we’re discussing outdoor spaces, you have plenty of room to use big items like barrels, large planters, pumpkins and even wooden signs which you can personalize with custom messages. We suggest using reclaimed items for added charm. Find inspiration on serendipityrefined. 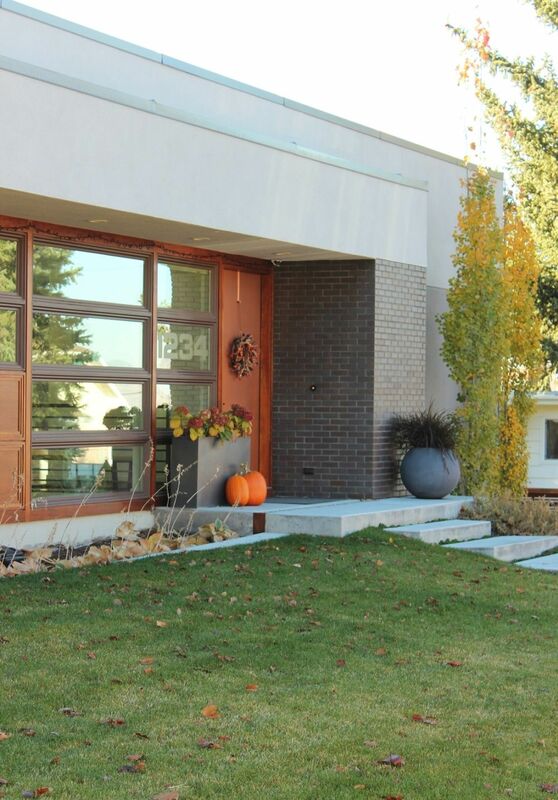 The concept of outdoor fall decor doesn’t necessarily imply you have to go all out and completely transform your home’s appearance. 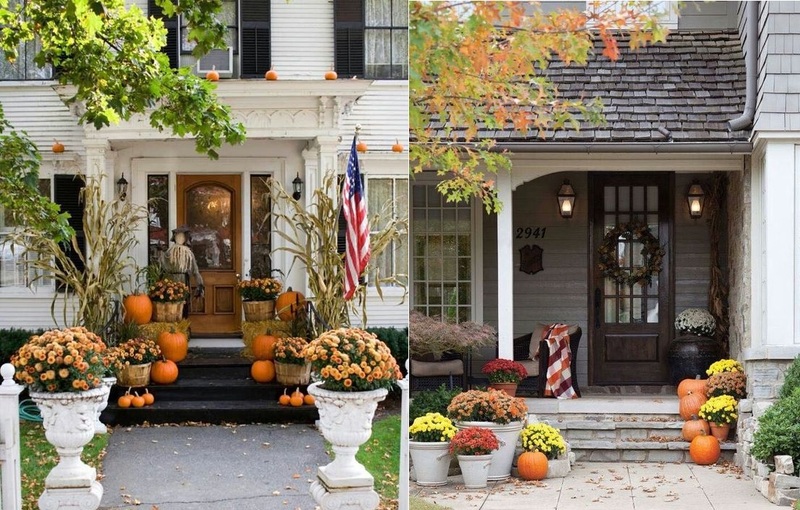 It can simply mean improving the curb appeal with a few strategically-placed items like a bright orange pumpkin resting against a gray planter or neutral-colored house facade. 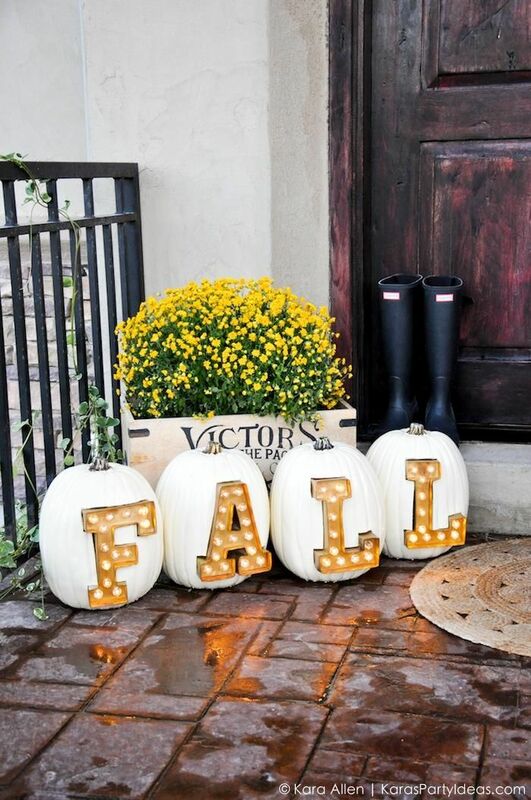 You can add a little big of glitz and glamour to your outdoor fall decor with marquee light letters which you can attach to white-painted pumpkins for a stylish contrast. Use faux pumpkins so your decorations can last longer. You could reuse them next year. Also, check out karaspartyideas for more details related to this project. Decorate your porch with things from your garden. 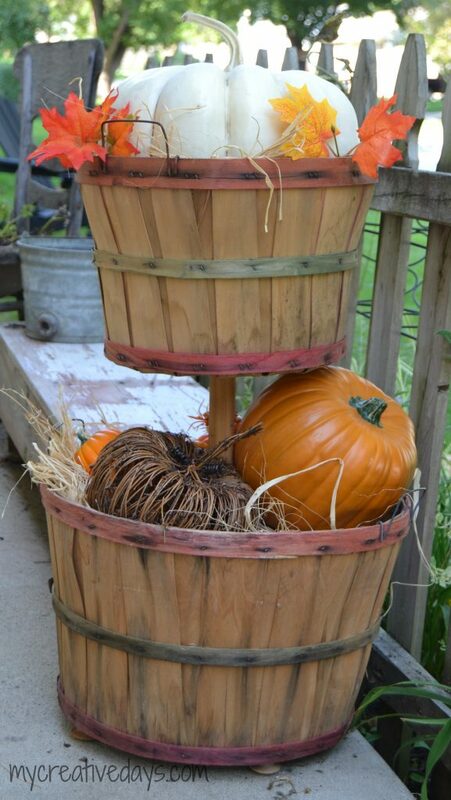 Take a large basket or a galvanized container and fill it with pumpkins, twigs, corn cobs, dried leaves and other things. You can make a bed of hay on which to display everything. The idea comes from threepixelane. Making a fall-inspired banner or sign can be a fun project for the whole family. It would be a simple craft. You can use a few reclaimed pieces of wood or a few boards all cut to the same length. you can paint the sign and then paint a message on it, either using a stencil or without one. Display this next to some seasonal planters, pumpkins and other similar things Find out more on themagicbrushinc. 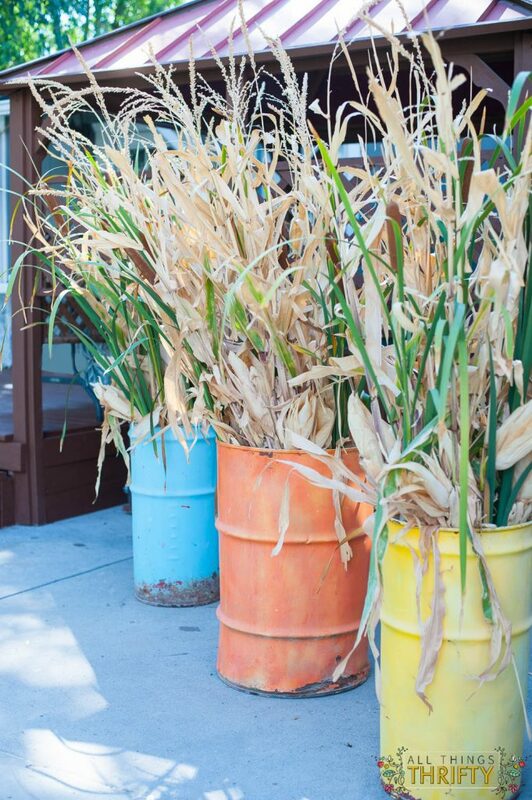 Here’s another fun idea for outdoor fall decor: take some barrels, paint them in fall colors and fill them with corn stalks and cattail. They’ll look nice for a few weeks after which you should get rid of the cattail before it makes a mess all over your yard. Keep in mind that you’ll need a lot of stalks to fill the barrels . The idea comes from allthingsthrifty. 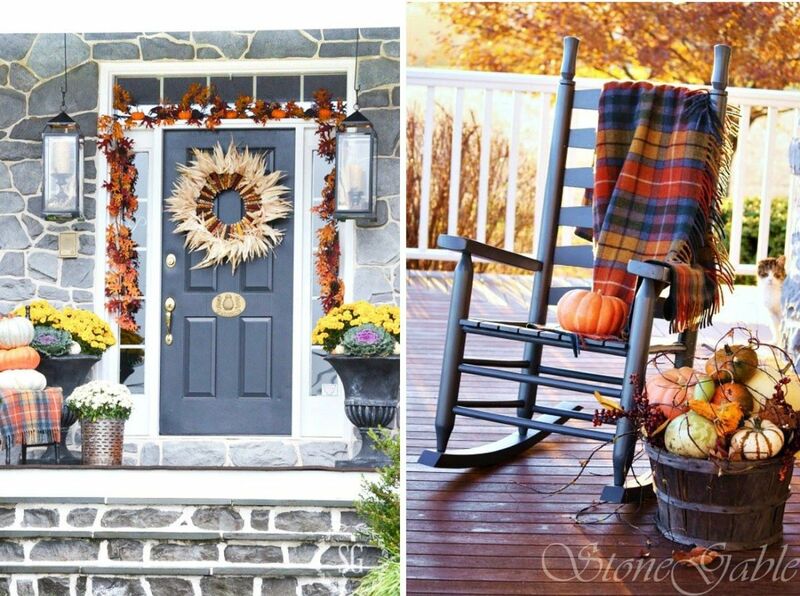 Fall is a season that we often associate with rustic and vintage decors and that’s something you can use to your advantage when decorating the porch and even the interior of your home. A cool idea can be to find an old chair and to take it outside and use it as a decoration together with a few other things. Check out this charming patio featured on organizedclutter for inspiration. 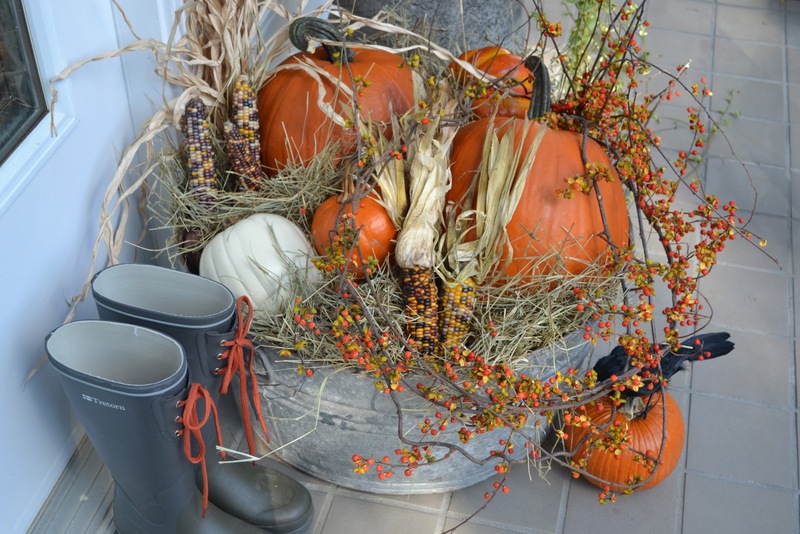 A lot of the supplies needed to make fall decorations for the outdoors can be found in the garden. For example, you can use corn to make a garland. You can display it above the front door or on the porch or the patio. Check out confessionsofplateaddict for more details. 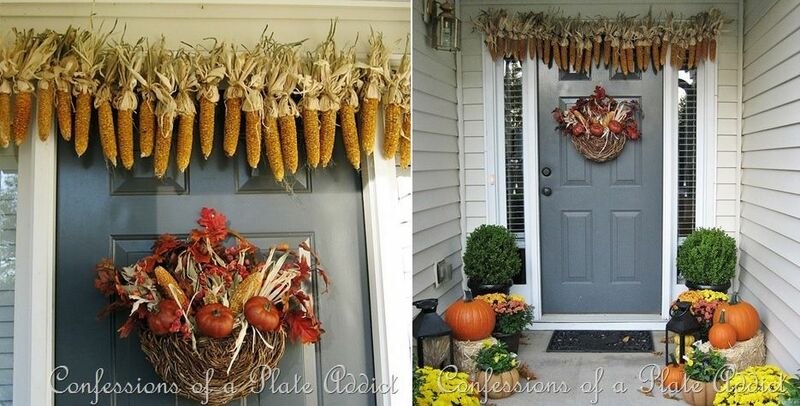 Dried corn can also be used to make a funky wreath which can be displayed on the front door. You can also hang a garland made of dried leaves and add a cozy rocking chair on the patio with a blanket and seasonal planters next to it. A basket full of pumpkins and gourds would also look nice. Find more inspiring ideas on stonegableblog. 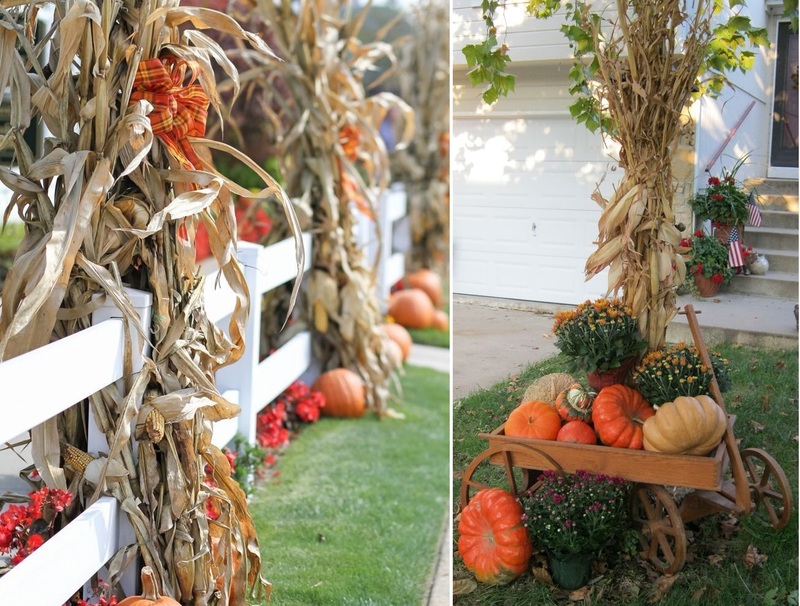 Corn stalks are actually pretty great and versatile when it comes to outdoor fall decor ideas. You can use the stalks to decorate the fence or you can tie some in a bunch and display that on the porch or the lawn, next to a few other fall-inspired decorations. Perhaps you could also use some props like a vintage garden cart for example. 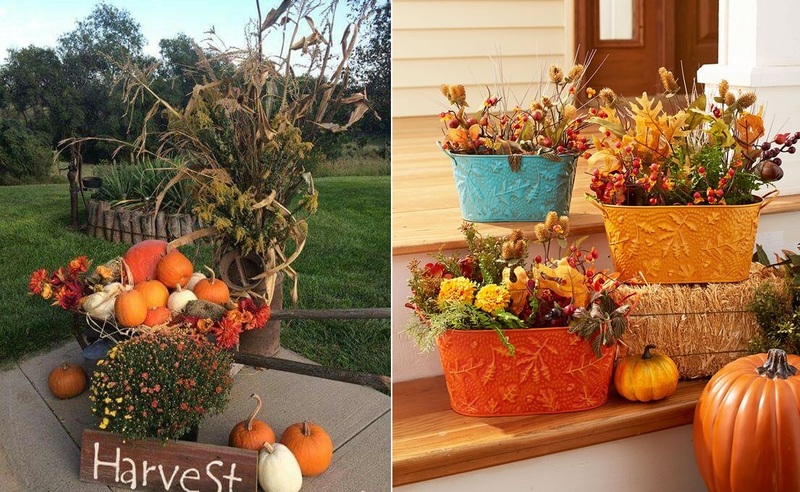 You might also like to prepare a harvest-inspired set of outdoor decorations which you can display n the patio, the porch or directly onto the lawn. You can either go with pumpkins and other veggies or with flowers. You’ll be able to also use these decorations for Thanksgiving and just add a few more accent pieces when the time comes. The pumpkins can be reused on Halloween if you want to make jack-o-lanters or to carve them. 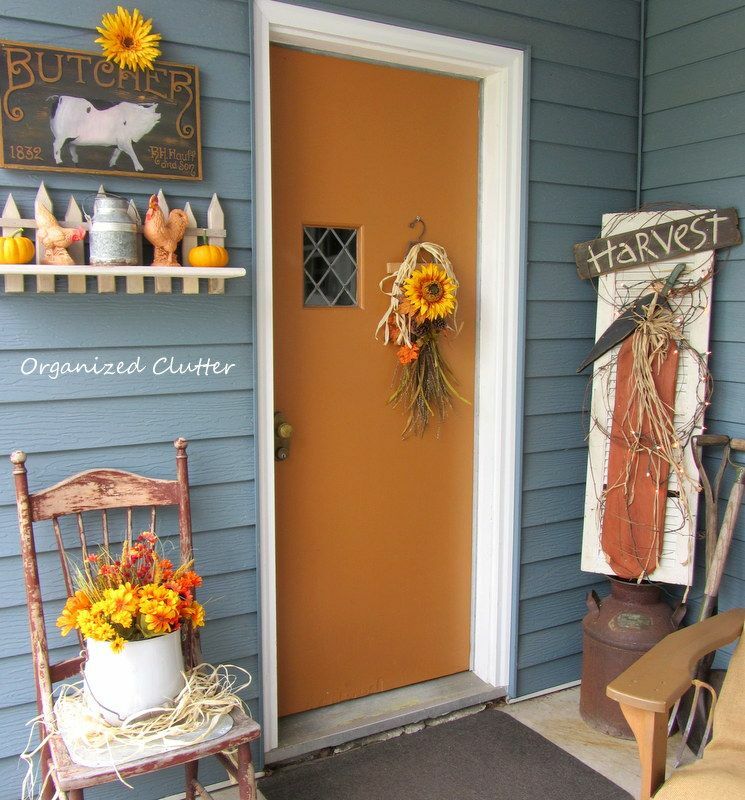 The color theme of your outdoor fall decor can be something very suggestive like orange (pumpkins are a great resource in this case) but you can also mix and match several color tones. Add a bit of yellow for a cheerful look or go with a darker theme to set the mood for Halloween. The post A Bountiful Collection Of Outdoor Fall Decor Ideas appeared first on Home Decorating Trends – Homedit.